How can I confirm that an item is eligible for a coupon? Why doesn't my PayPal transaction total amount accurately reflect my applied coupon discount? Can I use a coupon on any item? If my coupon doesn't cover the whole transaction amount how do I pay for the remainder? What happens if I make a purchase for less than the face value of the coupon or the maximum discount amount? The coupon has not expired. Yes, you must have a valid eBay account in order to buy an item at eBay and use your coupon. Learn how to create an eBay account. Yes, you must have a valid PayPal account in order to redeem your coupon. Learn how to create a PayPal account. In order to redeem a coupon, you must pay with PayPal. PayPal allows you to pay with your credit card, debit card, bank account or PayPal balance. Most eBay coupons are limited to one-time use. Please check the terms and conditions of your coupon to see how many times the coupon may be used. It depends on the terms and conditions of the offer. Some coupons can only be redeemed by you and thus cannot be shared. If the coupon appears in your My eBay account, the coupon may only be redeemed by you through that eBay account and its associated User ID. Therefore, it cannot be resold or transferred in any way. If the coupon does not appear in your My eBay account, it is possible you may share the coupon code with someone else. Please check the Terms and Conditions of the coupon for details. To see if an item is eligible for a coupon, please refer to the coupon criteria stated in the offer. Once the transaction is completed, and no longer pending, transaction details become visible by clicking on the posted transaction within your PayPal account. Payment specifics can be found within the "Paid With" detail breakout, where you will see a portion of the total that was paid via "Discount" which should correlate to the applied coupon amount. For more information and to clarify your coupon discount was applied, please see both your 'eBay Order Confirmation' & 'PayPal Payment Receipt' emails for complete details. After you have selected the item(s) you'd like to purchase, please proceed to the checkout page and enter the coupon code in the "Coupon, gift cards, or certificate" redemption field. Once you've entered the coupon code and click "apply" your total will reflect the applied discount. 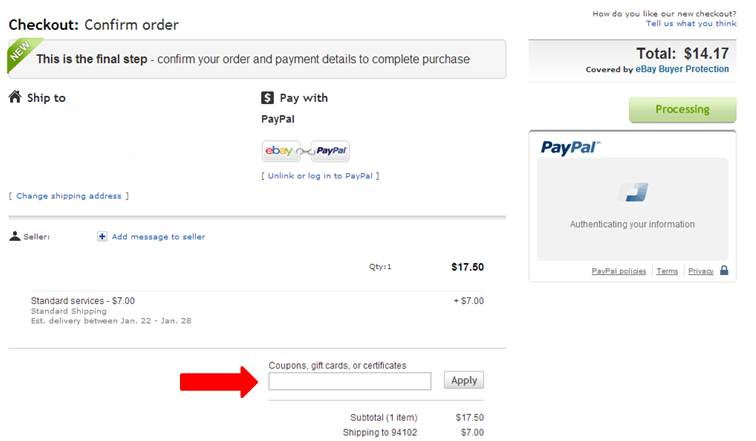 If you are using a mobile device, select the "Gift Cards, eBay Bucks, and Coupon" on the "Review Order" screen. If a coupon is available for you, it will appear on this screen and you'll need to check-mark the coupon during checkout. If a coupon is not available, but you have an eligible coupon code, please enter the redemption code in the "Gift Cards, eBay Bucks, and Coupon" field. You can use your coupon with any item(s) that meets the offer's eligibility requirements. Eligibility requirement will vary depending on the offer, please be sure to read through the coupon offer. You will receive a refund for the entire portion of the purchase you paid for. Single-item coupons will also be returned, but their original expiration dates will still apply. No, a coupon cannot be combined with any other Coupon, Gift Card, Gift Certificate, or Voucher. Any unused difference between the actual amount of the discount received and maximum amount will be forfeited. No, since coupons are automatically converted to regular currency at the time of redemption, you will not be aware that a coupon was used to fund the payment. No, you will still receive a single payment.